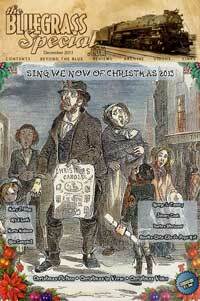 The earliest operas were not operas at all, but music theater entertainments. 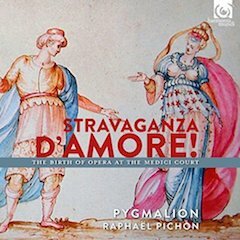 This new disc from Raphael Pichon and Pygmalion, Stravaganza d’Amore! on Harmonia Mundi, aims to re-capture some of the excitement of the earliest days of opera at the Medici court in Florence. Rather than play a disc of excerpts, Pichon has created a series of Intermedi made from music by composers who created the earliest operas. Opera in Florence had its origins in the experiments by the Florentine Camerata in modern styles such as monody, combined with the Florentine court’s taste for elaborate musical spectacle, often involving the same composers and librettists from the Florentine Camerata. An important milestone was the Florentine Intermedi of 1589, music theatre interludes written to go between the acts of a play, Le Pellegrina, for the marriage celebrations of Ferdinand de Medici and Christina of Lorraine. The sumptuous world of the ‘Intermedi’: Late sixteenth-century Florence was a theater: first and foremost a political one, in the eyes of the dynasties that wished to use the arts to display their power. A humanist one too, as is shown by these intermedi (interludes) that sought to achieve the perfect blend between music and poetry, the ideal of a certain Renaissance. Inserted into plays imitating the ancient writers, these entertainments were presented with lavish visual and musical resources. After reaching an initial peak in 1589 with the intermedi composed for Bargagli’s La pellegrina, this tradition was prolonged in the burgeoning genre of opera by such composers as Peri, Caccini (Euridice, 1600) and, very soon, Monteverdi (L’Orfeo) and Gagliano (Dafne). Rather than aiming for the impossible ideal of a reconstruction, on Stravaganza D’Amore Raphaël Pichon has devised a sort of imaginary intermedio by selecting the finest gems from this repertory, featuring the figures of Apollo, Orpheus and Eurydice, and above all Cupid: Love, Love, Love! In this extended album introduction, Mr. Pichon offers learned insight into the history of the Intermedi and the challenges posed by the era’s music. ‘Gioite al canto mio’ (Peri), from the recording session for the new album by Raphaël Pichon and Ensemble Pygmalion, Stravaganza d’amore! Featuring Renato Dolcini, Luciana Mancini, Sophie Junker, Zachary Wilder, the album was recorded at Chapelle Royale in Versailles. Imbued with drama, musicality and sophisticated settomgs, these Intermedi were such a success that they were repeated without the play. The first attempt at opera seems to have been Jacopo Peri’s La Dafne in 1596/97. By 1600 at the wedding of Maria de Medici and King Henri IV of France, the celebrations included two fully sung dramatic entertainments, some of the first operas, Il rapimento di Cefalo by Giulio Caccini and others, and L’Euridice by Jacopo Peri. 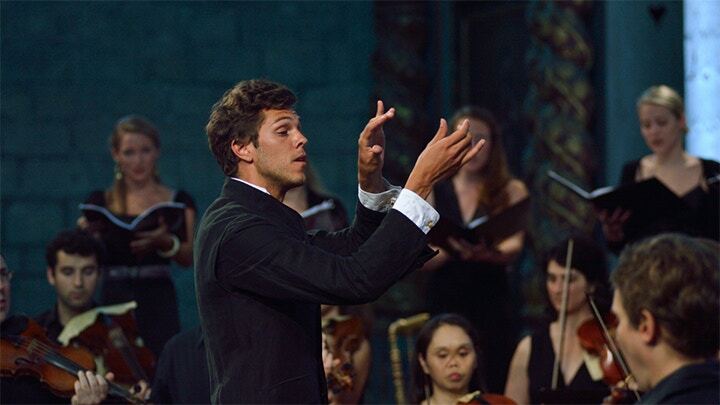 Only fragments of Dafne and Cefalo survive, so what we have here are newly created Intermedi—“All’imperio d’Amore,” “La Favolla d’Apollo,” “Le Lagrime d’Orfeo,” “Il Ballo degli reali amanti”–weaving music from all these early operas and intermedi forming a delightful potpourri. A more didactic approach, such as scenes in chronological order, might have been more satisfying intellectually but Pichon has gone for a more creative approach, re-constituting fragments into a new whole. The standard of performance is very high, with some notable solo moments. The recording was made in the Chapelle Royale at Versailles and whilst the solo moments are beautifully in focus, the larger scale choral and instrumental passages are surrounded by a significant acoustic aura that may not be to everyone’s taste.